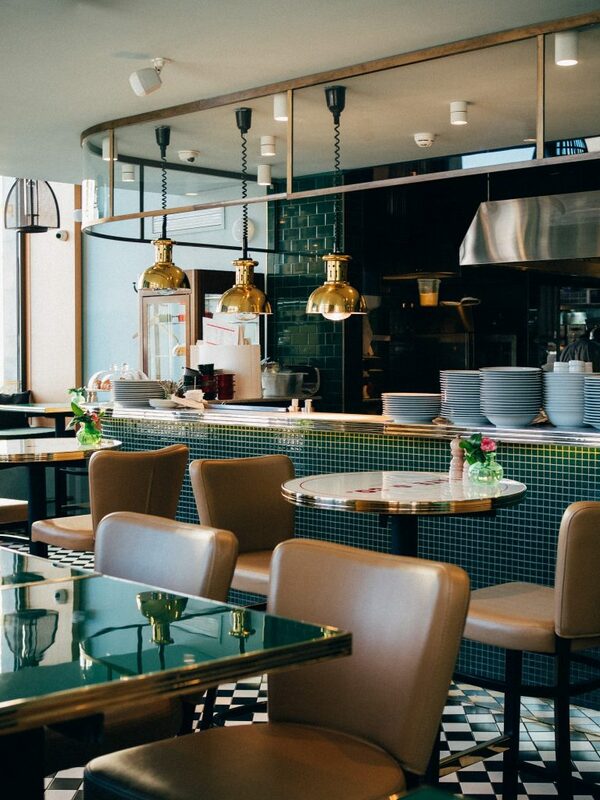 It may not be immediately obvious, but there’s a lot of thought that goes into the interior design of restaurants. Everything from lighting to music can have an effect on the dining experience and customer purchasing decisions. There are a variety of techniques used to influence diners’ purchasing and eating habits. If you are considering restaurant remodeling, you may want to employ some of these techniques in order to create a more engaging and inviting dining atmosphere. 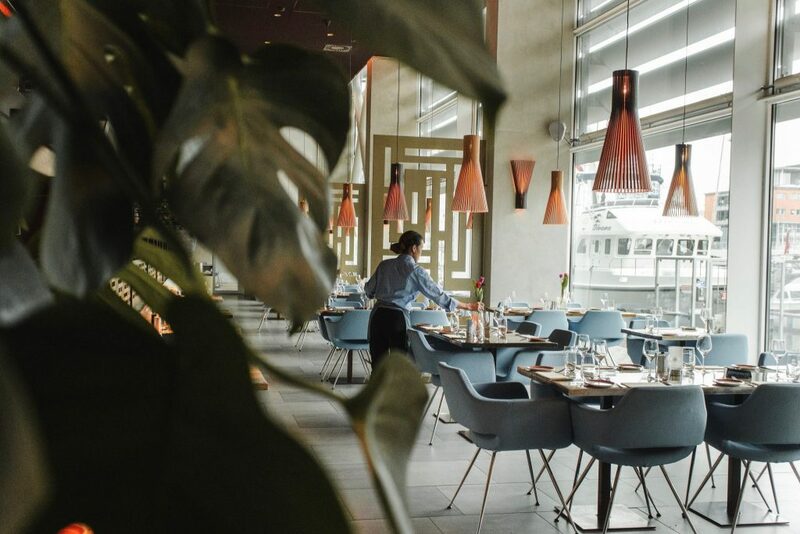 Even simple lighting changes or switching out the color of your plates can radically change your customers’ dining experience and overall satisfaction. Need a contractor for your remodel? Give Huebert Builders a call, we’d love to talk with you about our commercial building services and what we can do to help you improve your space! Layout plays a huge role in the aesthetic and functionality of your restaurant. If the spacing between tables feels awkward, consider employing a contracting service to add or knock down a wall. Sometimes, the addition of a single wall can completely alter a space for the better. If you are an upscale restaurant, consider creating nooks with walls and booths to make dining experiences for couples more private. Have large windows at your restaurant entrance? Consider adding bar seating! This is a great option for quick dining, bakeries, and coffee shops, because it allows solo diners to have a spot to sit without sitting at a large table by themselves. Many people feel more comfortable sitting in corners of a room rather than right in the center, so creating as many nooks and corners as possible with strategic wall placement can be helpful. Many restaurants stop thinking about customer experience when they get to the bathrooms. A clean, well-lit, and accessible bathroom is incredibly important. If your restaurant’s current bathroom space is small and cramped, consider expanding with a remodel. Additionally, maintenance and cleanliness are crucial. There’s no better way to turn off a customer’s appetite than with a poorly maintained bathroom facility. Lighting can have a huge impact on your customers’ appetite, and ultimately, their purchasing decisions. According to a new study, compared to exposure to dim light, exposure to blue light spurred higher hunger levels, starting 15 minutes after light exposure and those hunger levels stayed higher for about two hours after the final bite. This is interesting to think about, especially since exposure to blue light is more prevalent than ever with constant access to smartphones, tablets, and computer screens. Technically, your restaurant can capitalize on society’s screen addiction without even altering your restaurants light! However, it’s still a worthwhile investment to install appetite-inducing lighting. A Chicago University study shows that green and yellow toned light stimulate hunger. Consider installing tinted light bulbs or soft, warm toned lights. Edison-style lightbulbs are great for a warm, ambient effect, and look stylish too. Color choices for your restaurant’s decor also play a role in stimulating your customers’ appetites and encouraging their stay. According to the Rohm and Haas Paint Quality Institute, the color red increases blood pressure and heart rate, in addition to stimulating appetite. Yellow has a similar effect on hunger, as it is associated with energy and happiness. This is why many restaurants choose a warm color scheme for their interior decor. Ever wonder why so many fast food restaurants choose red and yellow as their main colors? It’s because they want to make people hungry before they’ve even realized they want a burger! Additionally, the color green represents abundance and health, so it’s a popular choice for health food or vegetarian restaurants. Colors to avoid include cool tones and blue. In the same study, blue was the least appetizing color, so it is best to use it sparingly or not at all. The reason blue isn’t hunger inducing? The primal brain associates blue with possibly poisonous foods, such as berries, so humans are literally wired to perceive blue toned foods as unsafe to eat. If you do want to use blue in your decor, use it sparingly, and do not use it in dining ware like plates. Music also plays a significant role in your customers’ dining experience. A study published in the Chicago Journal reveals that slow tempo music encourages patrons to stay longer, and consume more alcoholic beverages. Calm music encourages a more leisurely dining experience, while high tempo, loud music encourages a quicker meal. The Journal of Culinary Science and Hospitality suggests soft classical music increased diners’ satisfaction, while loud music and silence both result in a more informal, quick, and sometimes negative dining experience. The kind of music you decide to play at your restaurant should be dictated by the dining experience you want your customer to have. If you are a quick service establishment, consider upbeat pop music at a medium volume. If you offer fine dining and want customers to have a more prolonged dining experience, consider soft classical or jazz. Regardless of the kind of food you serve, volume should also remain at a level that still allows conversation. There’s no better way to discourage a customer’s stay than to have music blasting so loudly that they cannot hear the person beside them. However, some fast food restaurants use this as a technique to encourage a rather speedy dining experience, as eating quickly usually results in eating more, and they’d like to get more customers through. Are you thinking about a restaurant remodel? Or, maybe you’re looking to build a new commercial space for your new restaurant business? Either way, if you are looking for a contractor, call us at Huebert Builders. We also offer other commercial building services and remodeling, so regardless of the kind of project you have in mind We’d love to help you plan and execute your commercial building project.